Interviewer’s Note: Drew Adler is a 23 year-old wrestler based out of Georgia who is a regular for Universal Independent Wrestling (UIW). Adler has been working for UIW since 2010 and won the UIW Tag Team Championship with partner Colt Callaway just weeks ago. Aside from holding gold Adler has made some other significant accomplishments in UIW including winning a 20 man Royal Rumble in August 2012. In UIW, Adler has worked with some notable names including former WWE star Bull Buchanan. Outside of this company Adler has also wrestled for multiple NWA promotions, Vintage Wrestling (Vintage) and in July had his first match for Ring of Honor (ROH). Adler can be found on Twitter here and on Instagram here. This interview was completed on November 30, 2014. In this interview Adler and I focus on his work for UIW. Daniel Johnson: My first question is, for readers who may just be reading about you for the first time how would you sum up yourself as a wrestler in just a few words? Drew Adler: Well, I like to think of the way I wrestle as fun. I really do a lot of different stuff style-wise so there isn’t a label of high flyer or brawler. Daniel Johnson: How did you first get involved with UIW and what was your first impression of the promotion? Drew Adler: Well, I first came in to UIW in 2010 and did a series of matches with Michael Stevens. Back then there wasn’t four or five different promotions in the area running against it so it was the place to be essentially. They drew fairly good crowds at around 250 to 300. Plus with Bull Buchanan, Rob Adonis, Cru Jones and others it was a pretty good place to be. Daniel Johnson: Before we get into your individual work in UIW what would you like readers to know about UIW that may convince them to watch it or even buy a ticket? Drew Adler: UIW is nice considering it’s got a really good blend of talent. It’s got your old school, new school, women’s and everything in between. You can go to the show being whatever type of fan you are and see what you want to see. Daniel Johnson: One of, if not the most, successful wrestlers you have worked with in UIW is Bull Buchanan who you have even teamed with on occasion. What are your thoughts on Bull Buchanan and working with him? Drew Adler: Bull is the nicest pro wrestler you will ever meet. Considering he has been to the WWE and been on WrestleMania and could be a complete jerk to you because he has the right to be. He is so humble and kind. I owe so much to him as far as teaching me how to be a better wrestler. Daniel Johnson: Do you have any good Bull Buchanan stories? Daniel Johnson: Haha, cool. Moving into 2012 you had a program with Rob Adonis chasing the UIW United States Championship. What most sticks out to you about this program? 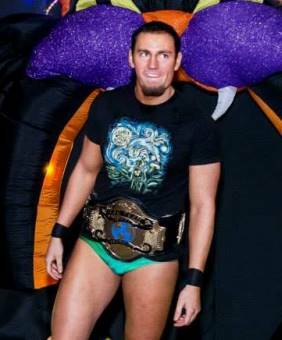 Drew Adler: The fact that I actually never got to have my championship match with him. We had multiple matches where I became the number one contender. It was a great program though regardless due to working with Rob. Daniel Johnson: You also won a 20 man Royal Rumble match in 2012. What are your thoughts of that performance and of battle royal type matches in general? Drew Adler: This match was interesting and also when Bull really started taking a liking to me. I was the first entrant in the match and halfway through I got thrown to the outside and held on to the ropes and landed on the apron. I ended up slipping and busting myself open on the turnbuckle. Bleeding quite a bit, I finished the match and won, came to the back and Bull called me a warrior. Daniel Johnson: Speaking of gimmick matches in UIW or even beyond it what do you think has been the best gimmick match you have taken part in? Drew Adler: Steel cage matches. Bar none. It adds such a different dynamic to a match. Plus even from a fan’s standpoint you are getting so much more for your money. Daniel Johnson: Correct me if I’m wrong, but in 2013 you didn’t seem to wrestle nearly as much for UIW. Why was this? Drew Adler: I was going out and wrestling different places. I just wanted to see where I could go in wrestling. Nothing too crazy. Daniel Johnson: Cool. This year you worked with Sebastian Cruz in the opener of one of UIW’s big events, UIW Summer Blowout. Do you feel any added pressure in being the first match on the card? Also, what are your memories of this match? Drew Adler: I actually like being the first match at a show. I like to call it the real semi main event. Cruz and any of the Florida guys for that fact are all really good in the ring. Cruz and I had a really good match at that show, much respect for that guy. Daniel Johnson: UIW is a promotion based out of Georgia. I was curious what do you think in general of the independent wrestling scene in Georgia today? Do you think it is one of the hottest in the country? Also, are there any wrestling promotions on the Georgia independent scene we have yet to talk about that you think readers should know about? Drew Adler: Well there are plenty of great indies in Georgia that if you are in the area you should go and check out. Whether it be UIW, Peachstate Wrestling Alliance (PWA), NWA Atlanta, All-Star Wrestling Network (AWN), any indie around Georgia I would definitely go and spend a couple of bucks for a great night of entertainment. Daniel Johnson: Looking to the future are there any UIW wrestlers you have yet to work with that you would most like to? If so then who? Drew Adler: AJ Steele. He knows how to bring it in the ring and I would definitely like to go with AJ again just this time at UIW. Daniel Johnson: Likewise, what do you most hope to get done in UIW in 2015? Drew Adler: The same thing I do every year Daniel…try and take over the world! Or just be the UIW [Heavyweight] Champion. Haha. Daniel Johnson: Haha, cool. I had a few non UIW questions, but before I move on I was wondering if there was anything else you had to say about UIW? Drew Adler: Yeah that’s about it. UIW is a nice place to check out. Daniel Johnson: Going a little outside your work for UIW in July you had the chance to wrestle Bobby Fish in ROH as part of a four man gauntlet match. How did this opportunity come about and what did you think of this match? Drew Adler: Well, I was invited to go to the ROH seminar and go and try out. It was a two day deal. The second day of the seminar they cut short to go to the Future of Honor  show in Delaware. So after the seminar we went to watch the show and I got selected to be a part of the match. Which was a great opportunity. Fish is an awesome guy and everybody at ROH is so supportive. Daniel Johnson: Speaking of ROH the company seems to just keep growing. Is ROH a place you would like to work full-time? Is it a goal for you at all? Drew Adler: Of course without a doubt. I’m planning on doing their next seminar whenever they announce it. If you don’t get it on TV then you should definitely go to the ROH website and sign up for the show. Daniel Johnson: Are there any ROH wrestlers in particular you would like to wrestle? Who do you think you could put on the best match with? Drew Adler: Roderick Strong, ACH and Adam Cole. Then again pretty much everyone in ROH would be fun. Daniel Johnson: Cool, outside of ROH are there any other companies you would like to work for in the near future? If so then where? Drew Adler: Of course WWE and TNA. I would like to actually try and go to some more states in general just to meet more wrestlers. Daniel Johnson: Would you consider WWE or TNA your top goal in wrestling? Also, which company do you think you’d fit in better? Drew Adler: Well, they should definitely be mostly everybody’s top goal except for a few people. Yeah they have the top guys from everywhere. I think I would fit better in WWE as far as the product that they have out now. Daniel Johnson: To end interviews I like to ask five short non-wrestling questions then some more very brief wrestling questions. First, what is your favorite song to come out in the past year? Drew Adler: Rancid’s “Honor is All We Know.” I’m real big on ska and punk. That album in general is really good. Drew Adler: Besides wrestling I really just watch Netflix. Superhero shows like Arrow and The Flash are really good and I’m big into The Walking Dead. Daniel Johnson: What is your favorite movie to come out in the past year? Drew Adler: Captain America: The Winter Soldier. I’m a big Captain fan. Drew Adler: The new [Chris] Jericho book [The Best in the World: At What I Have No Idea] is worth a read. Daniel Johnson: Have you tried any foods for the first time in the past year? If so then what has been your favorite? Drew Adler: Indian food is super good. I had a curry back in February and it was fantastic. Daniel Johnson: Getting back to the squared circle who is one wrestler 25 or under other than yourself you think readers should know about? Drew Adler: That would be my recent tag team partner Colt Callaway. We just became the UIW Tag Team Champions and he has really learned a lot already for being in the business for just a year. Drew Adler: Daniel Bryan and that’s just because he is the best wrestler in the world. And a real nice guy too. Daniel Johnson: Cool, what is your favorite match to watch as a fan? Drew Adler: John Cena and CM Punk from SummerSlam 2011 I think. Drew Adler: I’m not really one for ribs so I don’t do too many but one time Steven styles took Vicks VapoRub and went into a battle royal and started getting everyone with it under the armpit and it burned so bad. Daniel Johnson: What, if anything, has been the weirdest part of working for UIW? Drew Adler: The fans. They know how to keep it interesting. Haha. Drew Adler: Thanks for having me on and I really appreciate it. Follow me on Instagram and Twitter @drewadler1up. Correction: An earlier version of this article incorrectly named Atlanta Wrestling Entertainment (AWE) in place of All-Star Wrestling Network (AWN). The two are separate companies and should not be confused with one another.